The Japanese toy company Medicom makes Kubrick and Be@rbrick figures in the likeness of famous pop-culture characters. Click here to see my post about the Star Wars Be@rbrick figures. 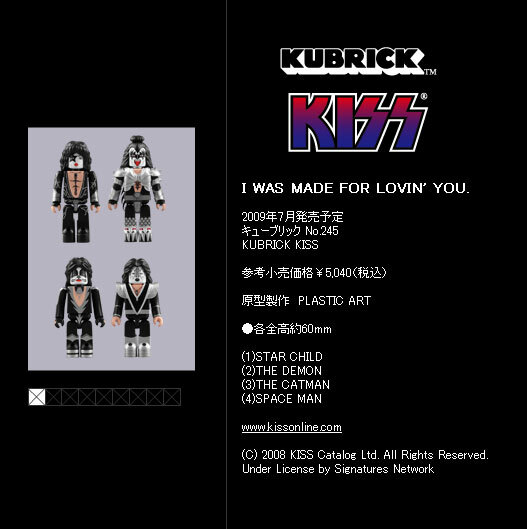 Well, thanks to Eric In Sendai that I found out about the KISS Kubrick figures. 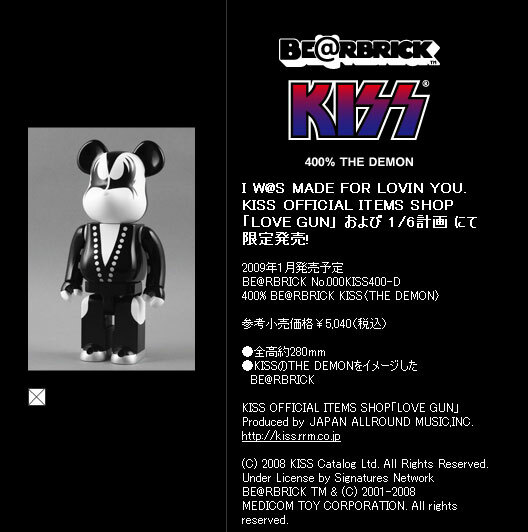 The Be@rbrick figures can be bought at the Love Gun KISS goods store in Tokyo. (I have been to that store a number of times). 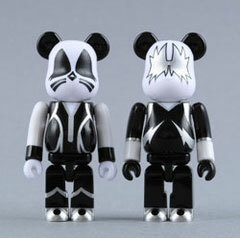 I won’t be buying the KISS Kubrick figures nor the Be@rbrick ones. They’re expensive. I was given some of the McFarlane figures as a present when they came out. But, I personally wouldn’t have bought them for myself. I don’t need the action figures myself. I liked the McFarlane comic books though. I bought a stack of them. Have you ever gotten any of the guitar picks that they throw at their concerts? I got one each of Gene’s, Paul’s and Ace’s guitar picks off the Tokyo Dome floor after the concert for KISS Reunion tour. My poison is dolls/action figures…so these are right up my alley. I really wanted (but couldn’t afford) those last 2 or 3 sets of giant KISS actions figures. THOSE had me drooling…but depending on which model/when/where, they all started at $75 each and up. You gotta have everything KISS-related, huh? You’ll be in trouble if you ever come to Tokyo…there are quite a few Japan-only KISS items. Unfortunately I probably will. I’ll wait until this weekend after I do this month’s bills. Are you gonna buy them? As I said before, I can’t find a site that has them. Really? Are you gonna order them online? >I wish Pepsi would do it too. These are more expensive…so don’t guess they’ll be giving them away with bottles of cola (like they’ve done with some of their other lines). I think these are available in Japan only…or via the internet. >What do you mean by “expensive”? The Kubrick KISS figures are ¥5040 for the set. 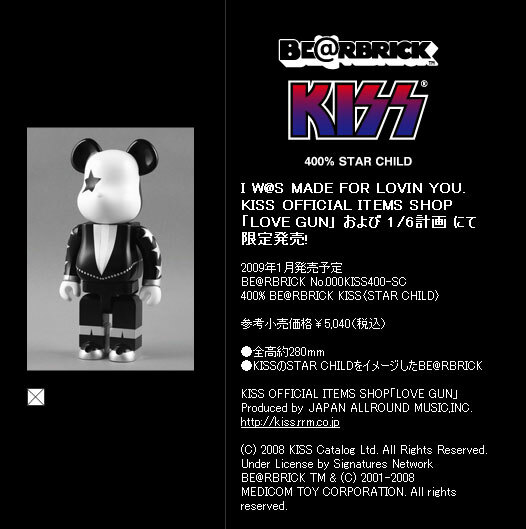 The Be@rbrick KISS figures cost ¥5,040 each! ¥3990 for the set of four. I wish Pepsi would do it too. I remember reading that they were being manufactured…but haven’t seen them anywhere to purchase. What do you mean by “expensive”? Yeah, I wish Pepsi would do a KISS Be@rbrick campaign like they did with Star Wars. I agree they’re really cool but much too expensive. 😦 Too bad.